Regarding Heroes Reborn, might there be the possibility of a historic class action suit on the part of viewers who end up suffering from whiplash, dizziness and overall head-hurt? Saying this NBC reboot is all over the place might qualify as the understatement of the millennium. Arising five-and-a-half years after the original left in disrepair and with greatly diminished ratings, the Tim Kring-created saga of everyday people with assorted extraordinary powers is back as a big, messy jumble. Veering back and forth and back and forth and back and forth from locales ranging from Yanqing, China to Carbondale, Ill., this one’s harder to navigate than a grocery cart with a dysfunction front wheel. 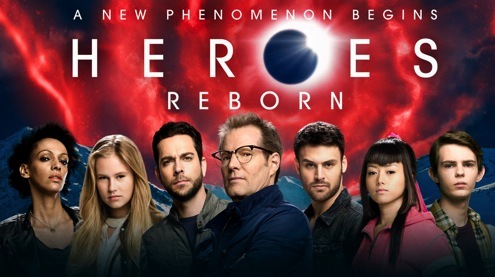 NBC is billing Heroes Reborn as a 13-episode miniseries and pledges to air all of them without a preemption. The first Heroes, one of the surprise highlights of the 2006-’07 TV season, eventually had its pulling power reduced by lengthy disappearances from the Peacock’s prime-time lineup. The first season averaged 13.9 million viewers, more than double the audience for the concluding Season 4’s 6.5 million. Many viewers simply gave up or became hopelessly confused by all the misdirections and re-launches. Thursday’s two-hour premiere of Heroes Reborn and next week’s Episode 3 were made available for review. The special effects can be arresting for a while. But the storytelling seems to be mostly so much gibberish. Divining what the hell’s going on may be an impossibility, in large part because maybe Kring doesn’t really know either. He lost his touch with Fox’s recent Touch. Perhaps Heroes Reborn amounts to nothing more than an irresistible payday. It certainly can’t hold a candle to its ancestor. The only holdover character in the early going is Noah Bennet (Jack Coleman), troubled father of onetime super-powered cheerleader Claire Bennet. Later episodes will include appearances by Heroes originals Hiro Nakamura (Masi Oka), Matt Parkman (Greg Grunberg) and Mohinder Suresh (Sendhil Ramamurthy). They’d better make it snappy. The most familiar face is Zachary Levi, who starred in NBC’s Chuck for several seasons. He’s now playing a vigilante named Luke Collins, who with his wife Joanne (Judith Shekoni) is hunting down those with extraordinary abilities. That’s because their son died in Luke’s arms at the big Odessa blowup. And they blame the tragedy on those who are “different” from mere mortals. One of those abnormals is nerdy teenager Tommy Clarke (Robbie Kay), who escapes a Collins-led massacre and flees to Pinehurst High in Carbondale. But Heroes Reborn doesn’t stay anywhere for very long in its unwieldy blend of rather random action scenes and constantly changing locales. Besides those already mentioned, the locales include East Los Angeles, Chicago, Tokyo, Canada, “somewhere in Texas,” the Arctic Circle and Midian, Colorado, which turns out to be home base for the Renautus conglomerate and a new “Epic” tracking device that can root out “every enhanced human” on the planet. Its sinister CEO, introduced in Hour 3, is Erica Kravid (Rya Khilstedt). She’ll get what she wants by any means necessary. But of course. There are many more characters to sort through, including heavy-drinking war hero Carlos Gutierrez (Ryan Guzman) and Tokyo’s Miko (Kiki Sukezane), who’s searching for her missing father and has Thursday night’s niftiest sequence after winding up in a video game. Through it all, an unnamed skulker played by Pruitt Taylor Vince (True Blood) appears to be orchestrating things while flashing a montage of satisfied smiles. Amid all the head-scratching perplexities, Heroes Reborn has a laughable sequence built around the drunken father of a high school bully. The big oaf is enjoying his favorite NBC show when Vince’s character comes knocking. “Not interested,” he bellows between beers. “I’m watching The Biggest Loser.’ ” Not for long he’s not. Subliminal message: anyone who watches The Biggest Loser deserves whatever they get. In other locales, Coleman’s Noah Bennet twice is on the verge of obtaining crucial information. But the purveyor dies in his arms before he can blurt it out. That becomes laughable, too. For intended grins, Noah has a tubby, bearded new ally in Quentin Frady (Henry Zebrowski), who’s convinced he’s on to something but doesn’t quite know what. Above all, there’s a world to be saved. But Heroes Reborn so far is anything but a world-beater when it comes to cohesive, comprehendible storytelling. Yes, “The Human Race Faces Extinction.” No, this isn’t the show that’s likely to make you care.